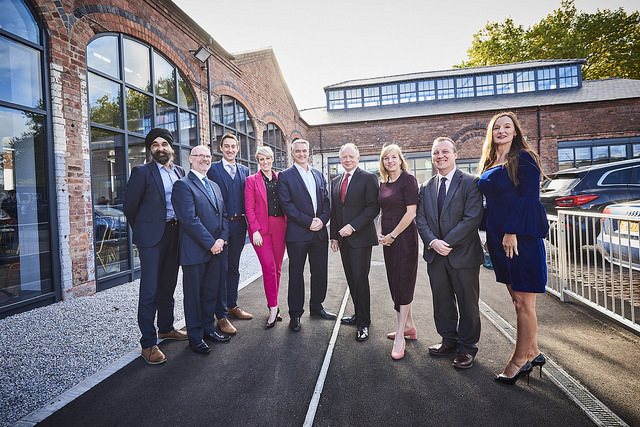 The new £12.5 million Elite Centre for Manufacturing Skills (ECMS) has been officially opened by journalist and television presenter, Steph McGovern, marking a significant investment in the future of high-value manufacturing and the metals sector. ECMS is a collaboration between the Cast Metals Federation, Confederation of British Metalforming, Institute of Cast Metals Engineers, In-Comm Training, University of Wolverhampton, Dudley College and the Black Country Local Enterprise Partnership. Based on a Hub and Spoke model, dedicated training centres are now fully operational in collaboration with training providers and professional industry bodies to both upskill employees and train new apprentices in metals processing skills. The ECMS Hub, based at the University of Wolverhampton’s £100 million regeneration project at the former Springfield Brewery, is an employer-led training facility for industry designed to build on the UK’s industrial heritage by providing specialist training, short courses and apprenticeships to upskill the current and future workforce, helping to close skills gaps identified by employers. The ECMS Spokes comprise the new National Foundry Training Centre based in Tipton, designed with the support of individuals from the Institute of Cast Metals Engineers and Cast Metals Federation, with advanced moulding and melting facilities which will be used to deliver foundry training at all levels, a new National Press and Tooling Centre designed and developed by the Confederation of British Metalforming and In-Comm Training, located at the In-Comm Training Academy based in Aldridge, focusing on the delivery of toolmaking apprenticeships and technical courses as well as the Spoke at Dudley College focusing on advanced welding training. Ian Fitzpatrick, Chief Executive at the ECMS, said: “This is a key strategic project for the Black Country which links further education and higher education with local, regional and national employers. It’s well known that the manufacturing industry has an ageing workforce and that bespoke training courses -specifically matching industry requirements – can be difficult to source. Steph spoke about the need to give parity to apprentices and those pursuing vocational routes, equal to those following more traditional academic pathways, stressing the importance of industry links with schools to encourage take-up of the opportunities that industry can offer. “Perhaps” she added, companies needed to project themselves as “technology companies that make things” as this might be more enticing to young people, as well as reflecting more accurately most UK engineering companies. Pam Murrell, CEO of the Cast Metals Federation agreed, saying: “We want to enable the development of the future leaders for our industry who need to be able to think on their feet, be innovative and ready for change, but with a good base of technical knowledge upon which to make informed, knowledge-based decisions”. Apprentices will learn off the job at one of the ECMS’s training Hub or Spokes equipped with new training rooms, metallurgy and metrology labs with access to partner training centres and state-of-the-art engineering facilities, whilst being employed in industry, so ‘earn while you learn’. All apprenticeships meet the New Apprenticeship Standards with a variety of delivery models available. Courses have been developed, with the input of employers, in casting, toolmaking, patternmaking, metalforming and foundry training, as well as mechatronics, product design and development and advanced computer numerical control and range of technical apprentice standards are available. The Black Country Local Enterprise Partnership approved £8.5 million for the project and the partners have invested £4 million.